I wanted to invite you to join an exciting and informative podcast event I’m participating in beginning Monday, July 17th. My friend Jill Parker, Practice Advisor, is the creator and host of this Success in Practice Event which brings to your inbox 19 dentistry experts over 19 days. Jill’s goal in creating this content is to provide valuable, free education to dental practice owners. If you’re interested, click to learn more and register. Congratulations to those who survived the tax deadline and thanks to the IRS for extending the deadline to April 18, 2017! I specifically want to acknowledge Chad Rogers and the rest of the tax team at PFG (Josh, Sara, Kate, Ryan, and Naomi). Most of you who are reading this benefited personally from their tireless work, laser-like attention to detail, and unnaturally high level of ownership. I wish each of our clients could see the inner workings of the well-run machine that Chad and his team have created. We’re always striving to get better, but wow! Good work guys. We’re all better off now that I’m not running that part of our business. This year we found this sentiment to be quite prevalent. Did you feel this way? 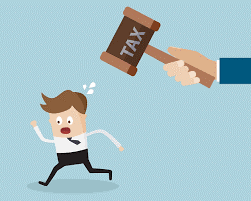 On the other end of the spectrum, a dental resident called me in a panic on April 10 saying that he had earned a small income ($24,000) and hadn’t withheld any federal or state taxes. He was scared at the thought that he would owe a small fortune. We quickly prepared his return and I delivered the news that he would get a refund of almost $5,000 due primarily to the Earned Income Credit (gov’t welfare delivered via the tax code). This guy was happy to be an American on that day. One of the most important things we do for our clients is talk them out of bad decisions. In life, the decisions you don’t make are as important as the decisions you do make. Like the decision not to do meth. Likewise, the investments you don’t make are as important as the investments you do make. We were recently introduced to a 65-year-old dentist who doesn’t have anything saved for retirement. Admittedly, he spent his life keeping up with the Jones’. Additionally, he blew his entire life savings (several million dollars, he told us) on a bad investment with a friend. Very sad. So inevitably we get a lot of phone calls from our clients asking some variation of the same question: “There is this really good investment opportunity that we’re really excited about. Do you think we should do it?” I should say that I admire our clients who call and ask. Wisdom, as it turns out, has more to do with our ability to seek and receive instruction than knowing all the answers. 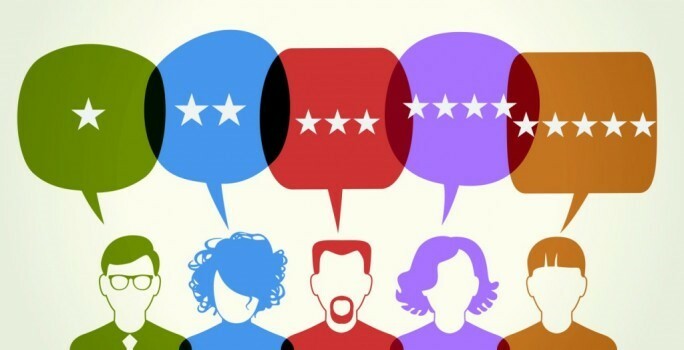 Upon reviewing his website, I noticed that he had over 100 5-star Google reviews (the Gold of marketing). He also commented that Google had recently removed an additional 100 of his 5-star reviews (for what reason we’re not sure). The first part of his answer is the most important – actually giving your patients the kind of experience they can tell their friends about. This is obvious. Everyone knows that you need to give your patients amazing service to be an experience worth telling about. This VIP-level service is something you should talk about frequently in your office. The ideas on how to do this don’t have to be yours. In fact, the best-implemented ideas may not be yours, but will come from your team. You need to be the one though to ask the question again and again and again: “What can we do better to deliver an exceptional experience to our patients?” And “how are we doing on delivering an exceptional experience to our patients?” And “what can we improve on to deliver an exceptional experience to our patients?” You get the point. Recently I met with a client who had an amazing experience. He lived close to a military base and years prior to our conversation he had landed a government contract to provide dental services to returned veterans. This was a lucrative contract as these vets needed a lot of dental work. Then one day he got a call from the program director; they were cutting their budget and they would no longer be sending patients to my client. Overnight almost 50% of his practice literally disappeared. Fortunately, he had been wise in his financial decisions and was able to absorb the shock without going bankrupt. But for the next several months his practice struggled. Business was slow and he was not producing. Finally, months later, his lead assistant asked to speak with him in private. She told him she knows why he is struggling and how to fix the problem. “You just need to recommend treatment,” she said. That simple: recommend treatment. Most doctors struggle with this concept. They don’t like to actually recommend treatment. So many doctors live under the fallacy that telling a patient “we’ll watch it” is a higher virtue than actually providing treatment. Sometimes it is, sure. But always? Buying a practice is, hopefully, something you’ll do just once in your lifetime and you’ll probably need to know how to get a dental practice loan to make it happen. Some dentists fear that, with how much they owe in student loans, they’ll never qualify for a practice loan. The truth of the matter is, that if you’re a dentist with at least a year of experience, a decent credit score, and demonstrated ability to produce some dentistry – chances are good you won’t have a problem getting a loan. At PFG, we hold the view that the multi-practice model doesn’t generally work. This is despite the fact that we could earn a lot more in fees helping doctors pursue their dreams of having 3, 5 or even 10 different locations – all needing bookkeeping and tax services. And it’s time we raised our voices that the multi-practice model is an epidemic. I remember when I had my first exposure to the multi-practice business model – 2008, pre-crash. I was a young associate financial planner and I had spent several days working on the complicated financial plan for this husband and wife team in FL, who owned 3 separate practice locations. When they came in for their consult they acted like they were on top of the world, and I thought they were – Rolex watch, tan skin, designer jeans, good looking couple, they had it all. Within the previous year, they had purchased office #2 and they had just finished building out office #3, which was big and beautiful. They had $5 Million of debt. But nobody cared because they were building an empire. “Something bigger than themselves,” as we so often hear. Plus, they could produce. They both put up big numbers. Most dentists make the mistake of chasing past investment performance. How do I know? 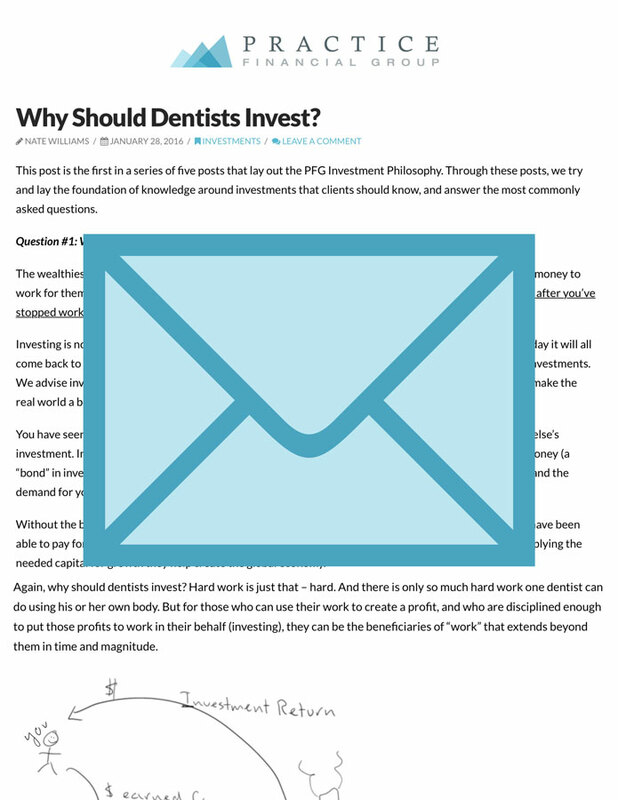 Because dentists are just like other investors, and the data overwhelmingly show that investors consistently, year-in and year-out, make the classic mistake of chasing the last hot investment trend or fund manager. 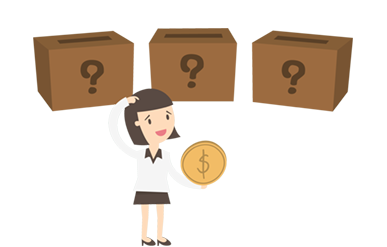 How do you decide how to invest your money? At PFG, we have a very defined, time-tested investment process that uses history, science and Nobel-winning research. We take that process and combine it with our knowledge of our clients to come up with a strategy that — while not guaranteed — is the best available option to help their investments grow over time. We believe you should avoid chasing past investment performance. But that’s not how most dentists do it. Not you, of course. I’m talking about those other dentists. Because I see the IRA, 401k and investment account statements from dentists who ask for our help after years of under performance in their investments. The results are sad. And it’s because their method of choosing how their money invested ignores data like the graphic below. The graphic to the left shows how many out of a pool of 2,758 mutual funds beat the market in the 10-year period between 2001-2010. Only 541, or 20%, did. Then, of that 541, it shows that only 37% beat the market during the next 5 years. Yikes. Let me illustrate my point with an imaginary conversation happening between me and some other dentist. See if you’ve ever seen other dentists think along these lines. The Other Dentist: “Okay self. Nice work. You’ve saved up some money and you’ve got it in your Roth IRA (or 401k, or brokerage account, or whatever). You are handsome and wise. Me: Yes. Wise and handsome. Don’t forget humble. Me: Excellent! Diversification! Costs! You’re on the right track and thinking about the right things. Have you read this blog before? Me: No. Don’t do it! Here’s what happened. The other dentist chased past performance. Remember the disclaimer “past performance isn’t indicative of future performance?” Well, this is what it looks like in real life. 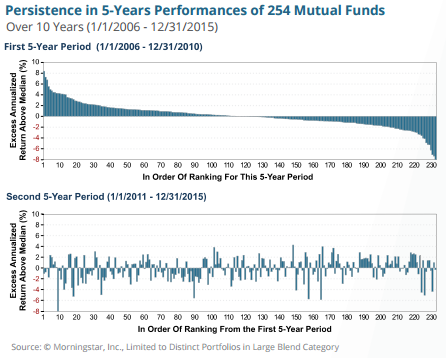 The graphic to the left shows the ranking of 254 mutual funds over a 5 year period best to worst. If you’re the fund manager of the one on the left, you were on the cover of magazines. If you’re the guy managing the fund on the right, you’re looking for a new job. You would think that is because the fund managers on the left are smarter, or have a better process, or something giving them an edge. Keeping their relative position on the chart identical, the graph below shows those exact same mutual funds for the NEXT 5-year period. Nobel-winning research points to the fact that “beating the market” as a fund manager is indistinguishable from luck. 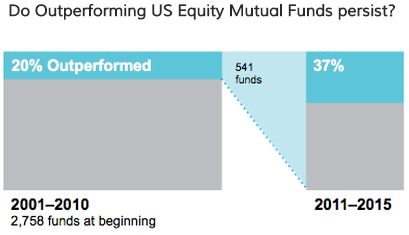 The winning fund managers got lucky. You, dear dentist, need to act like a golfer and first and foremost avoid mistakes. In golf, the tournament winner is almost always the golfer who makes the fewest mistakes. And one of the most common investing mistakes is chasing past performance. Be like golfers and first try to avoid mistakes with your investments. It can be hard to do. There is even research showing we’re hard wired neurologically to look for past winners and choose them when making selections like investments. Avoid chasing past investment performance. Instead, work with an investment professional that understands the markets, and knows you personally. Work with an investment advisor who is fee-only, and not incented to sell you a product. Work with someone who has a process for educating you as the investor, keeping you engaged, and helping you avoid the common investment pitfalls as you work towards retirement. That is exactly what we do at Practice Financial Group. There are ways of selecting investments that will provide a solid rate of return over time, while minimizing risk. We’ll continue to talk more about them here, and in other blog posts. Give us a call anytime to find out more. Need to have me talk to that “other dentist” in your life? Reach out anytime at brian@practicefinancialgroup.com to discuss your investments, or anything financial in your dental life because investments are too important to get wrong. Like what you read? Please read these other blog posts related to investing and share with your friends!